GCC Series Pipeline Flushing Machine - Buy Flushing Machine, Pipeline Flushing Machine, Washing Machine, Pipeline Washing Machine, Flushing Equipment, Washing Equipment, Pipeline Flushing Equipment, Pipeline Washing Equipment, Flushing Machine For Lubricating Oil System, Flusher For Lubricating Oil System Product on Lubricating Oil Hydraulic Oil Diesel Filtration---China Chongqing Lushun Co., Ltd. The function of GCC series pipeline flushing machine is to remove pollutants caused by pipeline construction (installation) process to improve system’s cleanliness so as to keep oil cleanliness within the contamination tolerance level of the key hydraulic components to guarantee the hydraulic system’ s working reliability and components’ service life. It is the necessary measures to clearing or minimise initial fault. Our GCC series pipeline flushing machine is a pipeline washing equipment designed for the pipe flushing and load test of hydraulic system especially applied to shipbuilding and metallurgical industry. It has the advantages like beautiful appearance, compact structure, convenient operation, reliable performance, low working noise, etc. It is particularly suitable for offline washing and test operation of hydraulic system pipelines in large ships and metallurgical equipment. It is suitable for purifying media such as hydraulic oil, lubricating oil, diesel, etc. 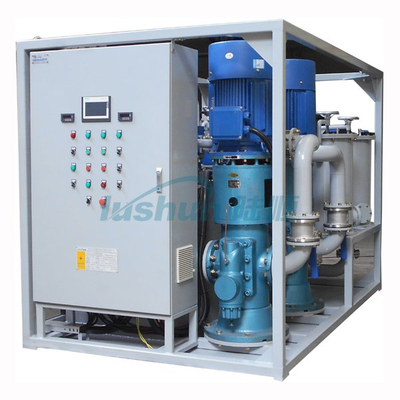 This machine consists of large flow capacity pump, oil tank, purification system, heater, meter, electric control cabinet, sampling valve, and other components. During running the machine, connect its inlet and outlet respectively to the inlet of oil supply mains on oil system tank and system to be flushed with temporary pipes to built a temporary circulatory system. The oil liquid is absorbed by large flow capacity pump from bottom of oil tank and finally turns back into the oil tank through pipeline one-way valve, pressure overflow regulating valve, system to be washed, first filter and second filter step by step. The oil flow flushes and circulates in the pipelines at a certain pressure and flow rate, impacts and breaks off the adhering contaminants on the inner wall of pipelines, then the adhering contaminants shall be removed by coarse and fine filters. By purification functions of filters and continuous purification while flushing, cleanness of oil in the pipeline meets the requirements of operation standard. And online particle detector can be its optional components as per user’s requirements. Note: The maximum pipeline diameter is the theoretical value to ensure hydraulic oil at turbulent flow status in the pipelines. ■Above size and weight of this machine are for reference only, the specific data shall be subject to its physical object.